This present CD does not display the revolutionary side of George Antheil. This music would not cause riots in the Parisian salons or New York�s Carnegie Hall. There is nothing of the �bad boy� in these five interesting pieces. They are all from the last two decades of Antheil's life and reflect a rapprochement with more conventional sounds. To understand where this music fits into the opus it is necessary to give a brief outline of the composer�s life, works and influences. Perhaps Antheil's most famous or certainly most notorious composition is the Ballet M�chanique. This work may be the most important example of modernism from the 1920s. The composer wrote in his autobiography that �he played in Paris for the first time ... rioting broke out almost immediately. I remember Man Ray punching somebody on the nose in the front row. Marcel Duchamps was arguing loudly with somebody else in the second row.� Would that a performance of music by Jimmy Macmillan caused such excitement in the Bridgewater Hall! But in those days disturbances at concerts usually implied that the composer was a genius! The Ballet M�chanique was scored for an outr� ensemble that included a small aeroplane propeller, a large aeroplane propeller, gongs, cymbal, woodblock, triangle small and large electric bells etc. I listened to this work again as a part of preparing my thoughts for this present review. Of course a lot of water has gone under the bridge since its first performance at that fateful night in Paris. No longer seen as being extremely avant garde, it is quite obviously a masterpiece of its time. A suitable reference point for what all the music that was to follow. Of course he fitted well into European society at that time. He was friends with virtually everyone that mattered. The list is impressive � James Joyce, Ezra Pound, Gertrude Stein, Pablo Picasso, Salvador Dali and Ernest Hemingway. In the musical world he received support from Eric Satie and Igor Stravinsky. At this time he lived in Paris above the Shakespeare & Co bookshop which had recently published Joyce�s �Ulysses� to considerable controversy. His entire catalogue includes some three hundred compositions including six symphonies, many chamber works, film scores and operas. Most of these have not yet entered into the popular repertoire. But the reason is not his dalliance with the extreme avant garde. One of the strange things about Antheil, is the fact that as he got older his style changed - and in a more conservative direction. In the mid 1930s he left Germany and returned to the United States. There he adapted his music to a neo-romantic and loosely neo-classical style. It is to this part of his career that the works on this present CD belong. I am not sure that we can regard the Third Symphony as a masterpiece. For one thing the form itself is a little loose. Perhaps it is easier to regard it as a collection of four tone poems played end to end rather than as a unified symphony. In fact the third movement, the Golden Spike was successfully excerpted from the symphony in 1945 by Hans Kindler and the National Symphony Orchestra. Yet, on the other hand it is not fair to condemn the work because it may lack a little cohesion. It is quite definitely an American work. However the composer assures us that it is not backward-looking. Here we find no slaves singing across the waters by the orange groves or cakewalks in Kentucky or old time renditions of Moody and Sankey. This is modern America - the land of opportunity, skyscrapers, steel, freeways and broad horizons. The third movement perhaps epitomises the mood of the work. The Golden Spike is not some kind of mythical or legendary artifact - it is actually a symbol for the �American Dream.� Of course, it originates in the spike that was driven into the track on the completion of the Trans-American Railway. But perhaps Antheil's imagery is more Route 69 than Casey Jones! There are four movements to this work - Allegro, Andante, The Golden Spike and Back to Baltimore. This last movement is the most interesting from a musical point of view. Quite neo-classical in its form it refuses to jump onto any kind of jazz or swing bandwagon. However it is full of lively and powerful tunes that drive the music on relentlessly. It is this last movement that makes me most feel that the work lacks stylistic consistency. Yet having said this, it is quite clear that this is a fine work that will stand against much that has been composed over the last hundred years so. It has an exuberance that excuses any minor defects in formal construction. I have always been a fan of Tom Sawyer and Huck Finn. So it came as a pleasant surprise to discover and hear this attractive overture based on the young lad�s exploits. If only I had known this work 35 years ago it would have added magic to my explorations of Mark Twain�s great stories. As it is this overture is full of a kind of �all American� sound. Lots of interesting melodies and rhythms topple over each other as this exuberant work unfolds it merry and slightly mischievous way. One tune in particular asserts itself in an almost Ivesian way. Great stuff � it should and could be an encore at any orchestral concert. It shows the composer at his approachable best. The Hot-Time Dance is reputed to be the only surviving movement of the American Dance Suite composed in 1948. This attractive �rhapsody� was premiered in 1949 by the Boston Pops Orchestra. It is just a romp from start to finish. Lots of slightly jazzy tunes and rhythms underscore this tightly formed work. If ever there was any doubt about Antheil's ability to write for orchestra, then listen to this sparking score. Echoes of da Falla and Enescu are probably coincidental. For a good bit of �Americana� the overture McKonkey�s Ferry is hard to beat. The work is based on George Washington�s heroic crossing of the Delaware on Christmas Night 1776. This was composed in 1948 and is one of a series of concert overtures on American historical or literary themes. There are allusions to the Tom Sawyer Overture and listeners who know the 6th Symphony will see similarities in the use of �vigorous motor rhythms.� An attractive piece that has in places all the iciness of that fateful day all those years ago. The Capital of the World is the last work on this CD. It is a ballet based on the depressing story by Ernest Hemingway about the life of a young man called Paco who is determined to go to the big city, Madrid and become a bull fighter. There he meets a number of people who challenge his view of the heroism of the toreadors. Unfortunately Paco is killed in an accident in the kitchen of a hotel where he is temporarily working. There is not a lot to add to this. However I am amazed at the sheer power of this score. The themes just seem to tumble over each other. I have rarely heard such invention. If this was the only piece to have been composed by George Antheil it would have entitled him to a huge reputation. Do not spend much time looking for influences and comparisons with other works of the period; it is really quite eclectic whilst having a satisfying unity of its own. However a nod to Bernstein or Khachaturian may be worth keeping in mind. It was composed in 1952 and received its first performance a year later. Interestingly, it was transmitted live on television. As always with CPO I cannot fault the presentation of this disc. There is an impressive closely written ten-page essay by Eckhardt van der Hoogen. This is extremely illuminating and essential bearing in mind that there is comparatively little available to better understand Antheil�s contribution to music. The disc itself has superb sound quality that allows us to hear every nuance of these fascinating works. Hugh Wolff and the Frankfurt Radio Symphony Orchestra are powerful advocates of this largely undiscovered music. The cover picture is by Californian post-impressionist Alfred Richard Mitchell and is entitled �La Jolla Cove.� It is a well chosen picture that somehow seems to sum up the neo-classical and neo-romantic mood of the music. 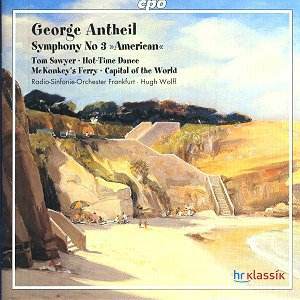 George Antheil is one of the �great� American composers. Of course he will never compete with Copland, Barber and Bernstein in the public imagination. Yet for sheer inventiveness, interest, musicality, variety and often sheer fun he cannot be bettered. I feel that with the CPO symphonic cycle and Naxos contributions on the �American Classics� series we have the basis for a major reappraisal. If I am honest, I enjoy George Antheil�s music as much as that of the above-named composers. And that is, I feel, saying something very positive about the composer. He may not have been the promised genius, but he is certainly a major composer and a master craftsman to boot.